The NEW WG-601 Wireless Hotspot Kit is the complete package for selling or distributing your wireless network. This is the easiest and most efficient way to start a public WiFi hotspot. Now with enhanced 802.11G mode!! Service Offerings - define up to 4 different service offerings which can be purchased by your customers. Instant Hotspot � is a complete, self contained wireless EZ hotspot kit, access point controller, or "hotspot-in-a-box" solution providing complete AAA (Authentication, Authorization, Accounting) in a powerful, yet sleek unit. The Instant Hotspot® Wi-Fi hotspot access point controller enables individuals, entrepreneurs, and businesses to provide high speed wireless internet service without the need for implementing the back-office systems commonly required, although that feature does exist (a standard RADIUS client is included for customer roaming), if desired. Authentication Preferences - setup whether you want to allow open access or restrict your service to authorized users/accounts only. You determine and setup your service offerings using the configuration wizard. For instance, you could provide a FREE 30 minute access account to each customer who purchases a large latte in your coffee shop. Define up to 4 service offerings which you would like to provide to your customers. The Button 1 setting allows you to instantly generate an account with the button on the AG-100 printer. Simply press the button and the AG-100 printer generates your customized account receipt for your customer. Buttons 2-4 are accessible by your cashier via a web browser interface from any PC on the LAN. Your customer is now ready to access his new account using the receipt generated from the AG-100 printer. Your customer doesn't need to change any of his settings on his laptop or PDA in order to utilize your hotspot location. Customers will require an 802.11b or g compatible wireless device to connect to your hotspot such as a wireless card installed in their laptop. However, there is no software required on your customers computer. This means easier access for your customers and enables them to connect easier and with less anxiety about installing new software onto their system. Once your customer turns on his laptop or PDA, he just needs to open up his web browser to access the internet. 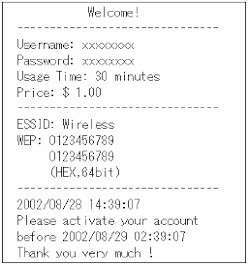 The WG-601 allows the owner to customize the customer login screen to your hotspot's look and feel. A customized login screen provides you with branded hotspot capability so that your establishment's branding is always in front of your customer. 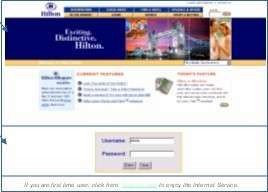 The WG-601 will sense your customer's connection attempt and present him with your customized login screen where your customer can enter their username and password to gain access to the internet. 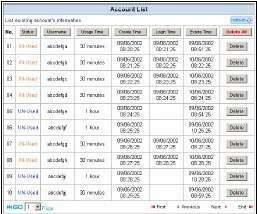 Keep track of your user's accounts by producing a list of active accounts. You can also maintain their accounts by changing or deleting their account information all from the secure web based account management pages. Users currently online can be viewed and disconnected with the click of a button from the current users list.